Imaginary Sight is Marko Daravelski from Macedonia. Legend of Psychedelic Sound !!! Founder and owner in Glowing Flame Records label. He has been active in the psy trance scene since the early days and began his career by promoting parties/events and as a DJ. Around the time his vision began to develop so he was also drawn to producing music. After couple of years experimenting in the sound-lab the Imaginary Sight Sound project was born. The sound is mystic and psychedelic with euphoric melodies for mornings and deep, atmospheric deviant vibes for the nights. Marko has played with many famous names of the scene and almost in every psy nation around such as Japan, India, Brazil, UK and the whole Europe. Marko will play his material in Ukraine for the first time. On our special request he will mix old and new tracks in one set. This will be something incredible!!! COMING SOON / More will be added soon! COMING SOON / More artists will be added soon! Digital & Visionary Art Exhibition of pictures, prints, photos, garments etc. New Moon is an energetically powerful time and a perfect tool for making coveted dreams. The most important thing is to do it sincerely and trust the power of the night light! 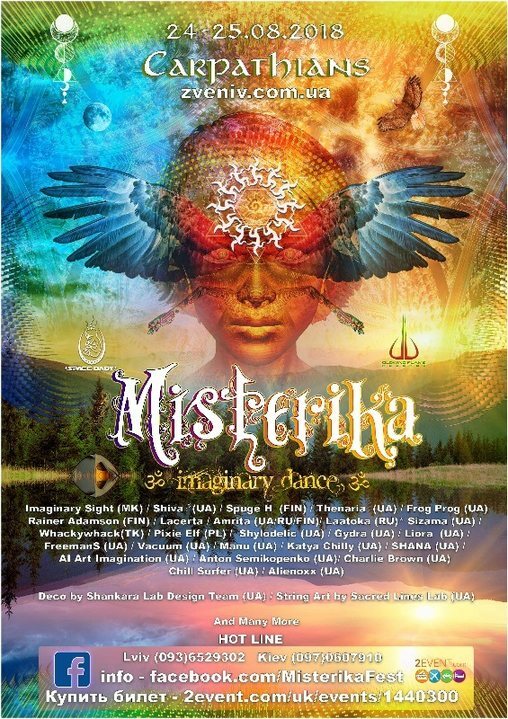 Magicians, we invite you to an adventurous and entrancing journey into the fantasy realm of Misterika Festival! - Educational tours related to the history and culture of the region. The door to another dimension opens only for unusual beings. This dimension is full of magic and supports your plans to realization! We are inviting you to the world of fairy tales, where eternal summer reigns and all beings are full of joy and sincerity. All creatures here have huge hearts full of endless kindness. So pack your magic chests, put on your fairy wings and fly into space of insanity and freedom. We will be waiting for you at the appointed hour because only you have the portal into the picturesque corner of paradise among the mountains, greenery and magic! After receiving party details on your email you can pay tickets. After payment tickets you will immediately receive information about the venue, placement, map and you can book rooms in the hotel. Important note! We do not consider applications from single artists - we are interested in performance, theater, masks, spiritual. After your application, you will receive an answer and contact with the curator of your site. PS: In order to be a part of our great family and to work with us, you don’t need to be a professional or a superman. We always work together and help each other in learning and in any joint activity. All you need is to have minimal knowledge in one or another area. The most important thing is to have a SINCERE AND GREAT DESIRE TO CREATE TOGETHER HERE WITH US! WARNING – LIMITED EDITION TICKETS!!! Free for children under 13 years old!! !